At UK Log Cabins, we’ve been supplying top quality outdoor timber structures and wooden buildings for more than 25 years. With substantial experience in constructing attractive timber framed buildings, we offer a wide range of wooden sports pavilions and clubhouses that are built to last. 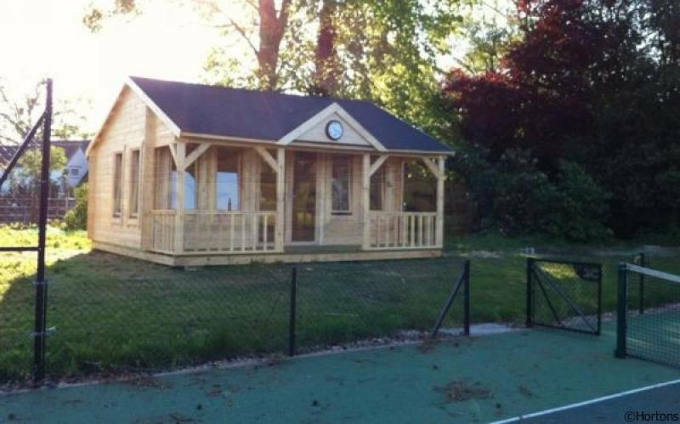 Whether you are looking to install sports changing rooms, a cricket pavilion or a log cabin clubhouse for your local sports club, speak to the friendly team at UK Log Cabins to get the perfect timber framed building for your requirements. We understand the importance of delivering products that meet our customers’ needs, both in terms of functionality and appearance. That’s why our range of sports pavilions is available as standard solutions, but we can also build bespoke designs to suit the particular specifications of your sports club, youth organisation or community facility. Whether you need the interior layout to be one large open space, or a communal area with changing rooms and shower rooms, or a fully self-contained clubhouse, UK Log Cabins will be able to design and erect a building to suit. In the first instance, why not take a look at our product range below to gain inspiration at what is possible? We can even design and build a timber building for you from scratch. 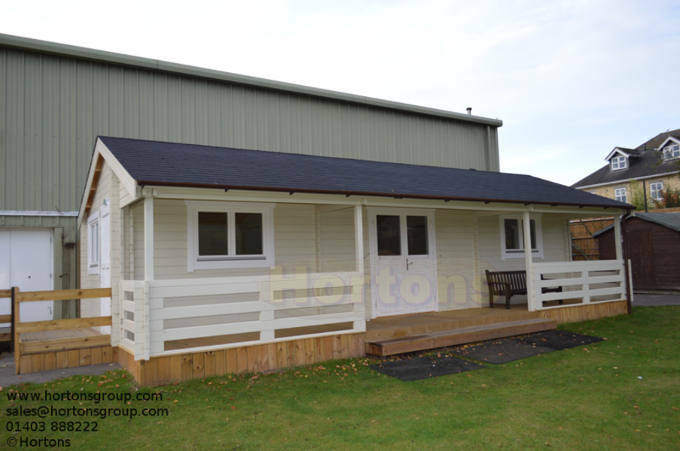 Our own dedicated factory is set up specifically to make one-off buildings, so customised clubhouse or sports pavilion solutions shouldn’t cost a fortune. For more information and to talk through all the options, our friendly, knowledgeable sales team is always available at 01293 822722, or you can visit our spacious showground near Horsham, West Sussex. For your timber framed clubhouse or cricket pavilion to be comfortable all year round, you may need additional insulation. At UK Log Cabins, our Twinskin Clubhouse and twinskin pavilions have walls with a thermal value that’s equal to that of a much thicker solid wall, giving you not only more space but the benefit of very low running costs as well. Our standard Twinskin models perform better than a mobile home, while the insulation can be upgraded to that of a modern brick built house at little extra cost. We know for a fact that UK Log Cabins’ Twinskin timber buildings offer exceptional insulation quality that goes beyond that of just about every other insulated timber garden building on the UK market! We are experienced suppliers of timber framed buildings for all kinds of uses – from private garden offices to workshops, wooden summerhouses, playhouses, timber framed garages and log cabin sports buildings. We pride ourselves on the aesthetic appeal of our wooden buildings as well as our commitment to sustainability. Using environmentally friendly materials and sustainably sourced timber from local suppliers wherever possible, we are making every effort to keep our carbon footprint low and minimise any damage to the environment. UK Log Cabins’ sports pavilions and clubhouses offer excellent value for money, being quicker and more economical to construct that many other building options. Our competitive pricing allows us to price match and often beat the rates offered by other log cabin suppliers for the same product. Take a look at our comprehensive online catalogue for detailed information about all our timber clubhouses and sports pavilions, including different size specification. If you are ready to purchase, you can order online immediately. Our extensive showground near Horsham, West Sussex, is well worth a visit for a more hands-on approach. Here you will find a wide range of traditional and contemporary timber structures for you to explore. Our sales team is more than happy to guide you through our showgrounds and answer any queries. For your convenience, the UK Log Cabins showground is open 7 days a week. 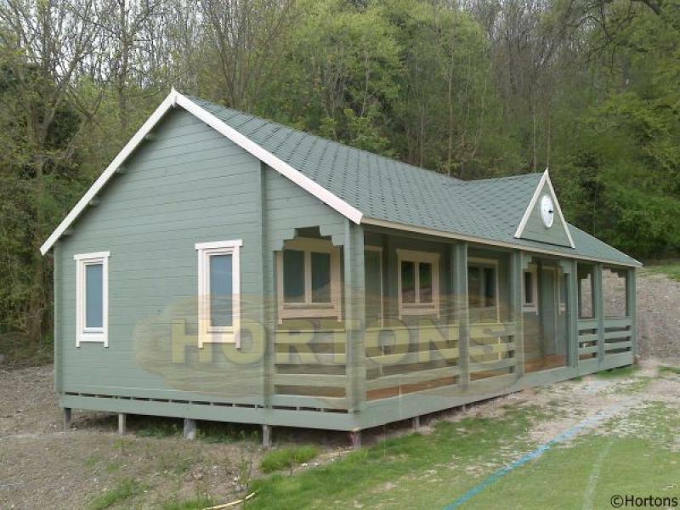 For enquiries about your next log cabin cricket pavilion, clubhouse or sports changing rooms, please call UK Log Cabins on 01293 822722 or email sales@hortongroup.com. You can also send a short message via our Contact Us form.